Hi everyone. Back with another watercolored card. Not completely happy with this, but I made it into a card anyways and am sharing it with you. I need to learn how much water to add when trying to paint and shade ... I think there's a big learning curve. Love the tip from the course on inking the sentiment and then adding a little water so when it is stamped it looked watercolored as well. Hope those of you celebrating Mother's Day yesterday, had a wonderful time. Our family, along with my DDIL parents, went for brunch at a nearby golf course. Lovely setting, delicious food, and the best company ... made for a wonderful time. :) I was spoiled with flowers, a plant for my garden, cards ... and best of all, an album of pictures of Cooper taken by a photographer when he was eight days old - so precious! I love the color you chose - great effect with this technique! TFS your beautiful watercolored card and ADORABLE Cooper :-) What a cutey pie! Your watercolouring looks great, Loll, and the rich colours are lovely. Gorgeous tulips! Cooper is such a doll! Glad you had a wonderful Mother's Day. Love the watercolored tulip! I've got to try the splatter. I love the effect! Mistakes...what mistakes, your watercolour class is certainly paying off. Love all of the cards that you have made with the classes. Just love your card, and the colours are so nice, and a beautiful photo of Mum and Babe!!! Hope you had a lovely day!!! He is surely a sweetie! Love this card and think you are being hard on yourself! Loved the copper colored one also! Another really beautiful card, Loll! Your tulips are so pretty, and I love how your sentiment has the 'water colored' look, too! 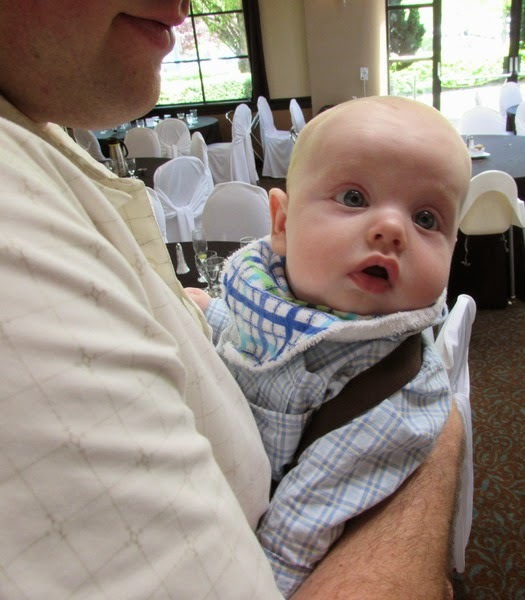 Thanks for sharing the pic of Cooper...what a cute little guy he is! Wishing you a late Happy Mothers Day, hope you hada wonderful day!! This card is beautifullly done , as usual. Love it. As always another beautiful card Loll, you truly are talented. Beautiful grandson too. Not sure why you're not happy with it Loll. It's amazingly effective and you've matched your dp with the tulips perfectly. p.s. glad you had a great Mother's Day ... me too! local zoo and eats out w my guys! I think you're being too hard on yourself - it looks fabulous to me! Love the splatters and the way you did the sentiment. This is so pretty, Loll, and I think you're being a bit hard on yourself about the colouring. Sounds like you had a fabulous Mother's Day. Cooper looks adorable. 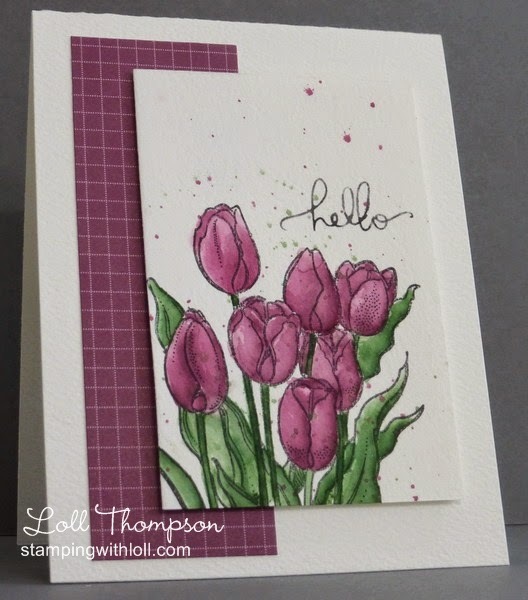 I think you did an amazing job with your tulip card, Loll...love the splatters and coloring! Awww...Cooper's sure growing up fast...what a sweetie!